Here is a simple recipe that is a crowd-pleaser. You can serve them up on a cocktail buffet, or as first course. If you manage to have any leftovers, put the filling in a pita and stuff with some spinach for a tasty healthy sandwich. In a medium bowl, combine the feta, sausage, apple, pecans and parsley, set aside. In small bowl, whisk together the vinegar, olive oil, mayonnaise, thyme and salt. Pour the whisked ingredients over the sausage mixture and toss to coat. Using a Tablespoon, scoop the mixture into the endive leaves. 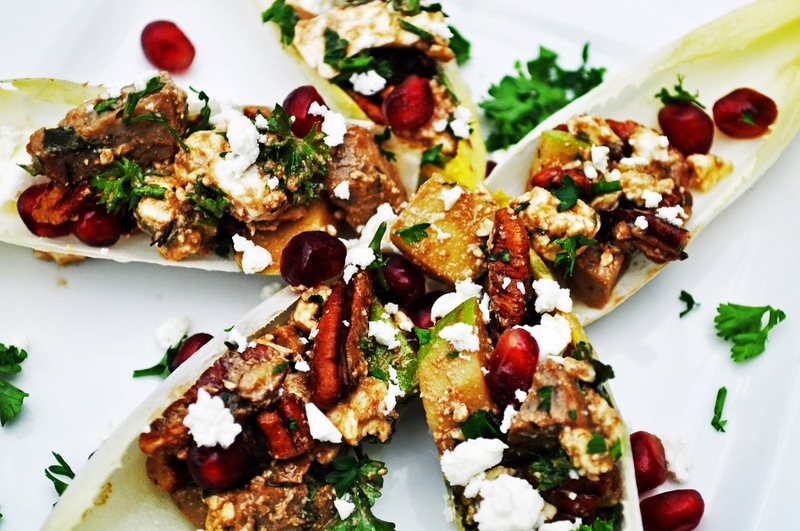 Sprinkle with pomegranate seeds, crumbled feta and parsley. Serve. As you might know, I was in the military and one of the best benefits ever to serving our country was traveling to others. My travels included some fantastic places where I learned to love other cultures and FOOD! I have a lot of recipes that I make and try to re-make almost weekly. One of my loves is for Filipino food. I am enamored by rice noodles and fresh vegetables. That is why this dish came to mind instantly. Pancit Bihon is made with rice noodles, any vegetables you want and basically any protein or seafood you can imagine. 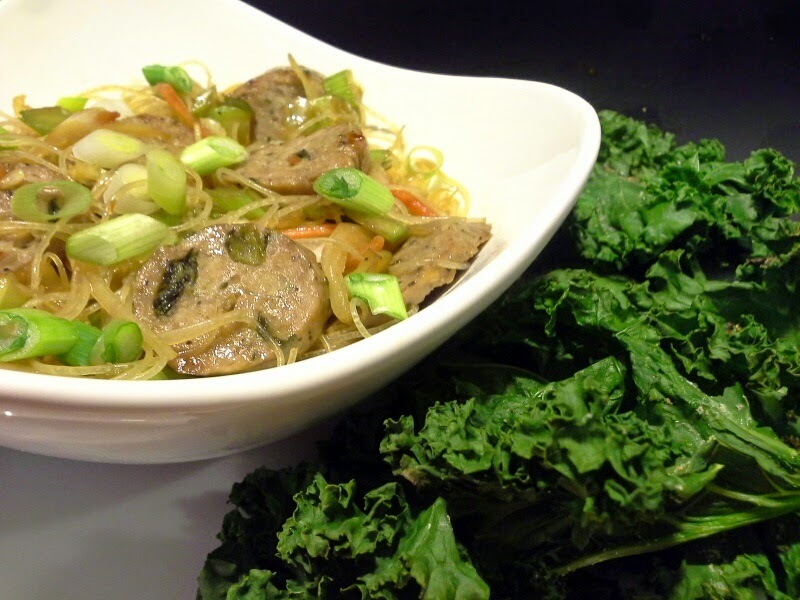 I, of course, would love for you to try it with Bilinski's Kale Balsamic Chicken Sausage, but to be honest, they have a multitude of wonderful all-natural, casing-free and gluten-free sausage that would be absolutely perfect with this dish. In a large container, place the noodles in warm water to soak while you start the rest of the dish. They will loosen up and you will need to move them around a bit. In a small frying pan with 1 Tablespoon of oil, add your sausage and cook until just heated through. Set aside. In a large frying pan on medium heat, add remaining 1 Tablespoon of oil. Add carrots and celery. Cook for about 2 minutes. Add in your garlic and half the green onion. Let it just cook through. Add stock, soy sauce and sesame oil. Bring to a simmer. Add cabbage, rice noodles and Bilinski's sausage. Toss to combine all ingredients. When the cabbage has wilted down a bit you are complete. Plate with extra green onions on top. I also roasted some kale chips as a side...you should ask the other 36 about their ideas for kale chips. They are amazing. You are going to be so excited about this dish. Try it with the other varieties of Bilinski's sausages. I know I am!! 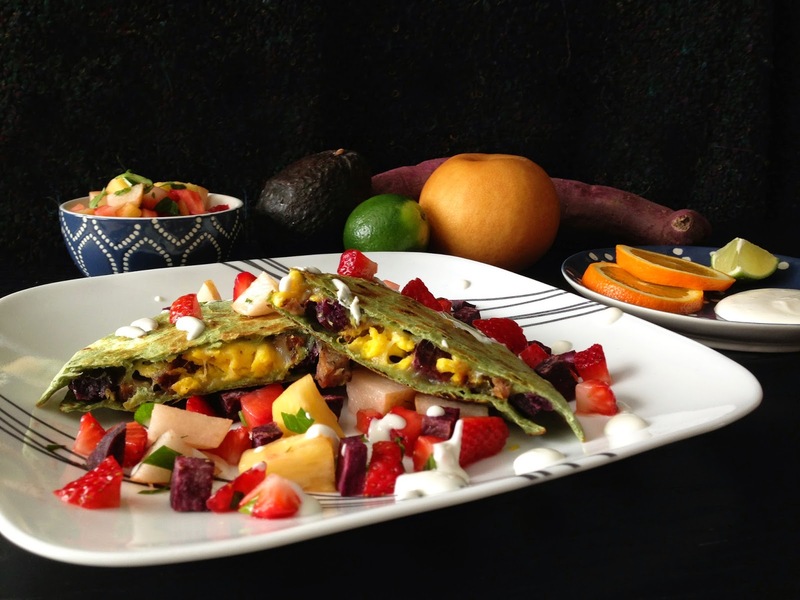 Breakfast, brunch, snack, or dinner, it's the perfect time for these quesadillas. When choosing a recipe for this challenge, I wanted something fresh, healthy and vibrant. A good friend of mine awhile back told me about these magical purple sweet potatoes he had had while in Hawaii 2 years ago. I've been on the lookout for them ever since and FINALLY came upon them at the store last week. Unlike many vegetables that have a tendency to fade when cooking, these keep their deep purple color. They do take a little longer to cook, so keep that in mind. But, if you can't find these beauties, a good ol' classic sweet potato will work just fine. I decided to pair this quesadilla with a fresh fruit salsa. I wanted one that could hold up a few days and not get mushy. If you've never tasted an Asian pear, they're more like an apple in consistency than a pear. So you can sub your favorite apple variety if you can't find these, as well. I also used the golden pineapple variety because of it's natural sweetness and smoother texture. If you use a regular one, just make sure it's more on the extra ripe side. Finally the yogurt dip. Either you love or hate Greek yogurt. If you don't like it, use a lighter sour cream. But, I think the addition of the citrus to the yogurt makes it taste very close. In a small bowl, gently mix the strawberries, pear, pineapple, lime juice, honey, cilantro and a pinch of salt. Cover with plastic wrap to avoid browning of the fruit. In another small bowl, combine the Greek yogurt and orange juice. Blend well. Keep in refrigerator until ready to plate. Heat oven to 350°F. Cover a standard sheet pan with parchment paper. Combine the diced sweet potato with olive oil, lightly salt and pepper. Roast for 40-45 minutes until tender, careful to not overcook. Remove from oven. Lightly coat a medium sauté pan with cooking spray. On medium-high heat, brown the sausage, stirring frequently as not to burn. Cook about 8-10 minutes. Remove from heat. In another sauté pan, add butter and eggs. Cook low and slow until just scrambled. Add the eggs to the sausage mixture. Quesadilla time! In a large sauté pan, lightly coat with cooking spray. On medium heat, add a tortilla, top with 1/4 cup cheese, 1/3 of sausage/egg mixture, 1/4 of potatoes, 1/4 cup of cheese and another tortilla. Cook approximately 2-3 minutes until lightly browned on underside and cheese has started to melt on the bottom layer. Carefully flip quesadilla over and cook another 2 minutes until golden brown and cheese is completely melted. Slide quesadilla to a cutting board and let cool slightly before cutting into thirds and plating. Repeat the previous steps to make 2 more quesadillas. (NOTE: you will have some potatoes leftover for garnishing the plates). Place quesadillas on plates or serve 'family style' on a platter. Sprinkle with the fruit salsa and yogurt dip. When the nice folks over at the Bilinski's offered us a chance to sample a new product of theirs, I was thrilled. This brand is difficult to find in my area, so it was a real treat to work with something that I otherwise might not have been able to locate. Their Kale Balsamic Chicken Sausage is very healthy and also very tasty. To me, that's a win-win kitchen situation! I decided to try my hand at an Asian-inspired appetizer, my take on those yummy little cream cheese filled nibbles, "rangoons". My version is much richer (my husband said that the filling reminded him of pate), and quite a bit healthier to boot. Yes, there is a bit of cheese involved, but they also include spinach, tomatoes, and other good things. These can be baked (if you're trying to stay healthy) or fried (if you're feeling naughty.) Either way, they are mighty fine little bites of flavor. They are very rich, so a few go a long way. They can be made ahead and frozen until needed, as well. Perfect for a large group or a quick snack! Warm the olive oil over medium heat in a small skillet and add the onion and sun dried tomatoes, cooking until both have softened, about 1-2 minutes. Add the spinach and garlic and continue to heat for another minute. Set aside. Combine the cream cheese (Neufchatel) and the mayonnaise in a microwaveable bowl. Heat for about 20 seconds and stir, mixing well. Add the diced sausage, balsamic vinegar, Parmesan cheese, and lemon juice and carefully blend the mixture together. Then add the spinach mixture and gently mix, microwaving for another 20 seconds if necessary. Make sure that everything is well blended, but do not over- work the filling. Also make sure that the filling is not too hot. Warm is okay to work with, but "hot" will create holes in the wrappers when filling them! Working in small batches (no more than 12 small squares at a time), gently place about 1/2 to 3/4 of a teaspoon of the sausage and cheese mixture in the center of each small square of dough (if you have other squares of wrappers sitting out, cover with a damp paper towel until ready to use them. Leaving them stacked also helps to keep them moist.) Using a pastry brush (or your fingers), moisten the edges of the filled squares. Pull two diagonal corners upward until they meet, and twist them together, closing the top of the rangoon. Gently squeeze the other sides together, closing any gaps where the filling could escape. Use your fingers to create "wings" with the sides, or continue by pinching them upward with the first two corners, creating an enclosed packet of sorts. Again, pinch closed any holes or openings in the wrapper, as to keep the filling inside of the rangoon. Shape as desired. Line a wire baking rack with a sheet of parchment paper (cut to fit the rack.) Preheat the oven to 350°F, and spray the parchment lightly with your cooking spray/olive oil. Place the rangoons carefully on the oiled paper (do not crowd them), and lightly spray the tops as well. Bake at 350°F WITH the convection feature turned on for about 9 minutes. If your oven does not have a convection setting, it will take another 1-3 minutes to completely cook the rangoons. Watch them carefully so that they do not burn. If you would like to make the rangoons ahead of time and freeze them, be sure to remove them from the freezer at least 2-3 hours before cooking. I do not recommend keeping these in the refrigerator for more than a day or two, as the chicken sausage is pre-cooked and is perishable. Also, the wrappers do not do well in the refrigerator once they have been filled, but not cooked. They are best eaten fresh out of the oven, either alone or with a sweet and sour dipping sauce or a fruit chutney/other sweet sauce on the side (to cut the richness of the filling.) Any that are baked, but not eaten may be refrigerated and reheated the following day in a conventional oven. They do not reheat well in the microwave. Did you make a New Year resolution to find a few healthy recipes this year? I sure did! Here in the Northeast, we are in the midst of another cold winter. It isn’t looking like we will get the same snowfall we experienced last year, but we are still dealing with below average temps and looking for comfort food to keep us warm. Keeping my New Year resolution in mind along with winter comfort food, I always turn to soup. Soup is warm, filling and satisfying. 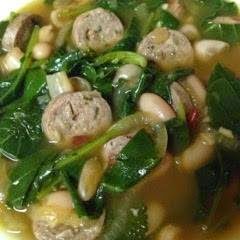 When I received the soon to be introduced Bilinski’s Organic Kale Balsamic Chicken Sausage, my first thought was to create a “Portuguese” Kale Soup. While the soup is traditionally prepared with linguica sausage and potatoes, my version is light, healthy and full of flavor! Heat the olive oil until shimmering in a heavy bottomed 6-quart pot or Dutch oven. Add the onion and sauté, stirring frequently until the onions begin to caramelize. Add the garlic and cook for about 30 seconds to release the fragrance, but do not let the garlic start to brown as it will become bitter. Add the salt, black pepper and Aleppo pepper. Now add the sausage and white wine, stirring frequently, allowing the sausage to absorb the flavors of the onion and garlic. Continue stirring until the wine has cooked off. Add the chicken stock and bring to a boil. Add the beans and lower the heat to medium low. Let the soup simmer for 10 minutes. Stir in the baby kale and turn off the heat. Taste and adjust the salt and pepper as needed. Let the soup stand for 5 to 10 minutes. Ladle into bowls and serve with crusty bread or soup crackers. This challenge could not come at a better time. We all try to eat better as a new year rolls around. I’ve made it my mission to eat healthy all year, but then there are donuts. I mean Krispy Kreme is just heaven to taste buds. Right? Not so much to your hips and arteries. Right? I love this challenge because it gave me the opportunity to come up with a dish that I could make again and again while continuing to eat healthy and starting the year off with a new, fresh recipe. 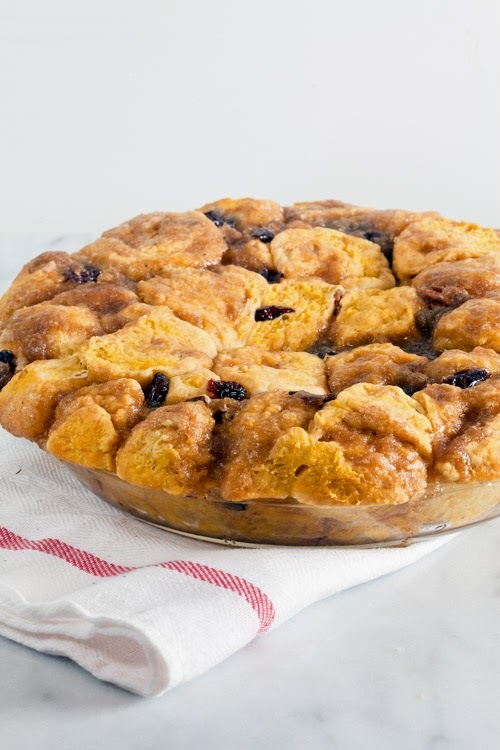 This recipe is found in Huckleberry. It doesn’t originally have meat in it, but I knew Bilinski’s Organic Kale Balsamic Chicken Sausage would be the perfect, healthy addition. I had never had quinoa. I love it! I can’t believe I went this long with never having it before. The texture of this meal was great with the Bilinski’s Organic Kale Balsamic Chicken Sausage. The flavors in the sausage combined with the quinoa and sweet carrots worked very well together. The creamy-ness of the fried egg yolk on top is just the perfect touch. Toss carrots in 1/2 Tablespoon of olive oil, a dash of garlic salt and pepper. Spread on a sheet pan lined with parchment paper and roast until brown and soft, about 35 minutes. In a medium saucepan heat 1 Tablespoon of butter over medium heat until fully melted and sizzling. Add your onions and sauté until lucid, about three to four minutes. Add the quinoa and salt. Sauté for a minute. Add 2 cups of water and simmer over medium heat until the water is absorbed, about 15 minutes. Remove from the heat and add the lemon zest, set aside. In a separate saucepan heat 1 Tablespoon of olive oil with the garlic until fragrant. Add broccoli, 2 Tablespoons of water and 1/4 teaspoon of salt. Cover and sauté until soft. Meanwhile, slice your Bilinski’s Organic Kale Balsamic Chicken Sausage. Once your broccoli is soft, add the sausage and allow it to heat through. This will only take about five minutes. Stir occasionally. Lower your heat and add in the carrots and quinoa. Mix until well incorporated and cook for an additional two minutes. Take mixture off of the heat and set it to the side with the lid on. Heat a Tablespoon of butter on medium heat until melted. Crack two eggs (or one at a time. If you do one at a time, you only need 1/2 Tablespoon of butter per egg). Allow the egg to cook until the whites are solid and set but allowing the yolks to be runny. I suggest cooking all your eggs before moving on so it will be easier to plate your food. Plate with the quinoa mixture and gently lay fried egg(s) on top. Sprinkle with fleur de sel. Serve immediately. On the way home to Atlanta after visiting friends and family in Texas for the holidays, we stopped in Jackson, MS for the night. It was New Year’s Day and we went in search of dinner. We located several interesting places to try, only to learn that they were all closed. We remembered that the hotel restaurant was open when we checked in, so we returned with low expectations. The hotel was a Jackson landmark that had been brilliantly redone and the restaurant offered Southern cuisine. Our waiter was adamant that we had to try the great Southern Gumbo, if for no other reason than it was New Year's and the gumbo had black-eyed peas and collard greens, two foods considered to be lucky foods in the South to start the New Year. After ordering a cup each, we were delighted and could have made a meal of the gumbo. After dinner I immediately set my mind to recreating it for this 37 Cooks challenge. This is not a traditional Louisiana-style gumbo, although it does use some common ingredients. Give it a try, I think you will be surprised! Place soaked black-eyed peas in a slow cooker and add chicken broth. Add water to cover peas by 2 inches and add bay leaves. Cook on high until peas are firm but tender, about 4-6 hours depending on slow cooker. Periodically check water level and maintain at 1 inch above the peas. Remove bay leaves. Place oil in heavy skillet or dutch oven and heat on medium heat. Stir in flour and stir constantly until mixture is dark brown, about 6-8 minutes, being careful not to burn the flour. Add chopped onion, bell pepper and celery and cook until vegetables are soft, constantly stirring mixture. It will be very hot, so carefully add to the cooked black-eyed peas and gently stir so as to not break up the peas. Add spices, okra, greens, tomatoes and sausage to the black-eyed peas. Continue to cook for one hour. Gently stir occasionally. Add shrimp and allow to continue to cook until shrimp is done. Serve with rice. What's better than a steaming hot bowl of chicken soup on a chilly day? 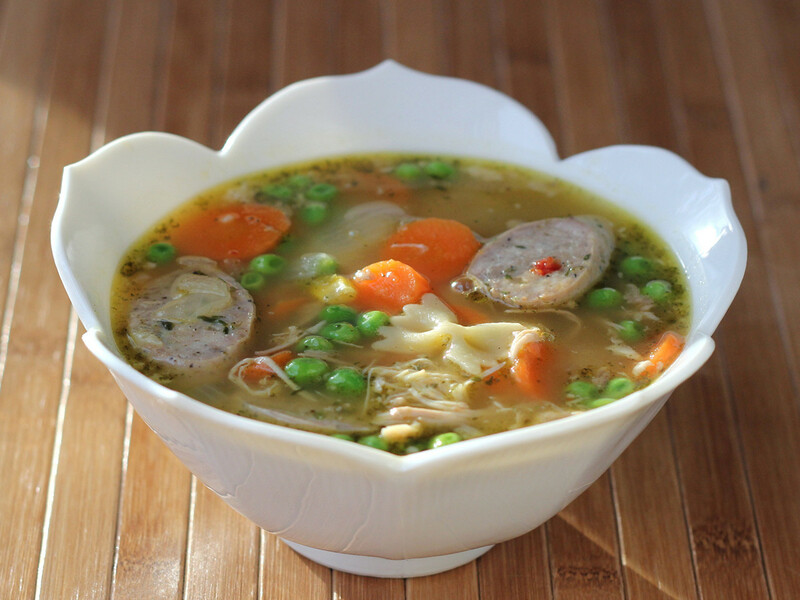 How about a bowl of chicken soup with chicken flavor that's amped up from using chicken thighs, chicken stock, and chicken sausage? But that's not all - vegetables and pasta add even more goodness. This is a filling soup that's nearly a stew - perfect for lunch or even dinner with a hunk of crusty bread. Homemade chicken stock is always best, but store-bought works in a pinch. If you happen to have leftover chicken you want to use, you can add that to the soup, and skip the chicken thighs. The soup won't be quite as rich, but there's a lot going on, so it will still be terrific. Peel and slice the carrots into rounds. Add them to the stock. Peel and dice the onion and add the diced onion to the stock. Slice the scallions into rounds - using the white parts and tender green - and add them to the stock. Add the poultry seasoning and parsley. We here at 37 Cooks are pleased to announce our latest collaboration. This time we had the great opportunity to team up with Bilinski's, a family-owned company run by Stacie Schonwetter and her father, Steve. For four generations, the Schonwetter family has been in the food business in the New York State, from Stacie’s great-grandfather Sol’s deli and import shop in Brooklyn, to her grandfather’s meat and cheese distribution company, to Bilinksi’s, acquired in 1983 from the Bilinski family. Joseph Bilinski started his company in 1929, making sausages in his home and selling door-to-door. The Schonwetter’s devotion to time-honored traditions and high quality ingredients was the perfect match for the Bilinski product, and they chose to keep the Bilinski name to honor the company’s history and legacy of providing the finest quality meats and ingredients. Today, Stacie and Steve’s mission is a simple, but passionate one: To provide a line of the highest quality natural and organic products in order to promote a healthy, flavorful and simple eating regimen. Their commitment to this mission can be seen by simply reading the ingredients list on their product packages. They include no nitrates or preservatives, all of the meat is antibiotic- and hormone-free, and has been raised with integrity in clean, comfortable conditions and fed a 100% vegetarian diet. The sausages have no casing, and are gluten-free. They also purchase their ingredients locally whenever possible. Wow! How many other companies can boast all of that? It was a true honor to work with Bilinski's, and we all enjoyed creating dishes around their brand new and delicious Kale Balsamic Chicken Sausage. It was a tasty product that made us feel good about what we were eating! 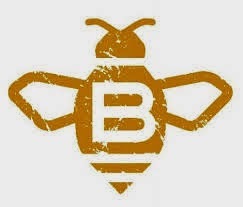 Many thanks to Stacie, Steve, and Aubree Kammler, Bilinski’s Marketing and Social Media Coordinator. We appreciate their willingness to trust us with their product, and we hope you all enjoy making and tasting these recipes as much as we did! 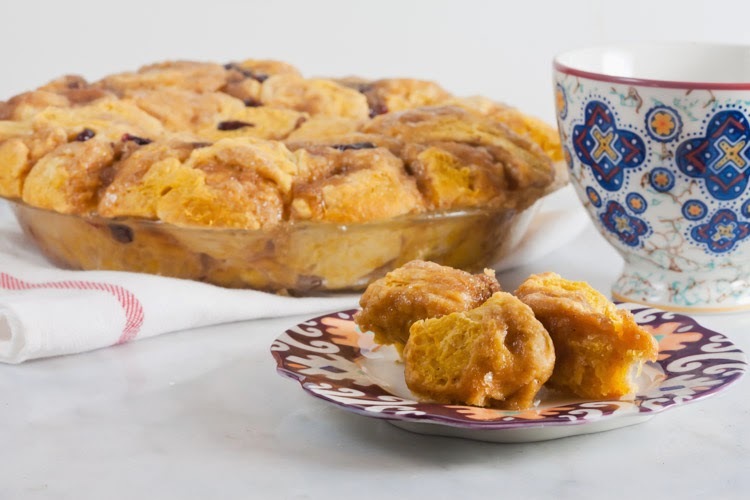 Have you ever made monkey bread? Apparently I've been living under a rock, since I didn't even know it existed until about a year ago, but I wanted in on the action! Monkey bread is a marvelous thing. It’s little blobs of soft dough baked together in a pan. 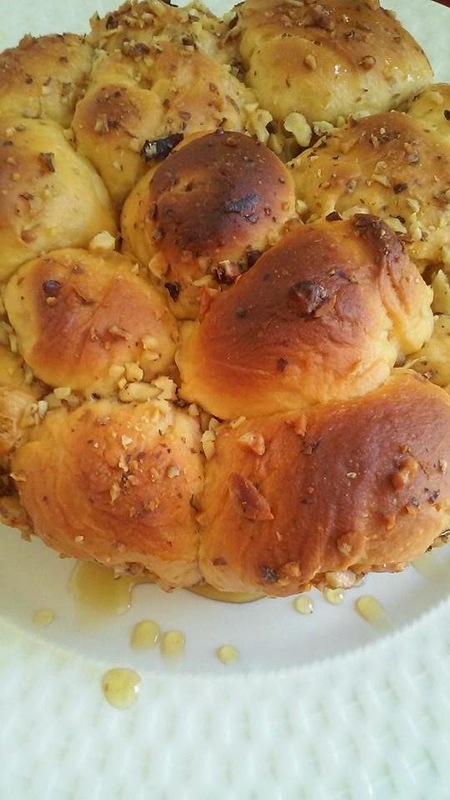 The result is a knobby sweet bread that you can pull together with your fingers. The individual pieces remind me of donut holes. I based this bread on the sweet potato monkey bread recipe in Make Ahead Bread: 100 Recipes for Melt-In-Your-Mouth Fresh Bread Every Day, substituting pumpkin and warm spices for the sweet potatoes and layering the bread with cranberries, pecans and a syrupy glaze. Line a mesh sieve with a coffee filter or cheesecloth. Add the pumpkin and let drain 30 minutes. Discard the liquid. Combine the pumpkin with the remaining ingredients, adding enough flour to form a thick dough. Knead until the dough is smooth and elastic. Cover with a tea towel and let rise until it doubles in size - about 1 hour. Divide the dough into golf ball sized pieces and arrange in a greased 8-inch pie plate. Scatter the pecans and cranberries between the dough balls. Cover and refrigerate overnight. The next morning, heat the oven to 325ºF. Remove the pan from the refrigerator. Melt the brown sugar and butter in a saucepan and pour over the bread. Bake 45 minutes, or until the internal temperature reads 190ºF. Let cool 20 minutes before serving. In a bread machine, load load the egg, water, sugar, potato, butter, salt, flour and yeast. Use the dough cycle. When cycle is finished place dough in a oiled bowl, cover and let rise for 1 hour. Spray a baking pan lightly with the non-stick cooking spray. Place honey in a bowl big enough to roll a few balls at a time. Cut each cheese log into 12 pieces. Cut dough into 24 pieces. Poke a hole into a piece of dough and stuff with a piece of cheese. Pinch hole closed and roll in your hands to shape it into a ball. Roll each ball in the honey. Place each stuffed ball randomly in the pan. Sprinkle each layer with walnuts. Drizzle any remaining honey on top and cover pan with plastic wrap. Refrigerate overnight. Preheat oven to 325°F and bake for 45 minutes until golden brown. Let cool 15 minutes. I made the dough in a bread maker, first adding all of the liquid ingredients (water and honey, along with butter if using it.) Then add the dry ingredients (flour, dry milk, potato flakes, salt and Italian seasoning. Make a well and add the yeast. Set bread maker to the dough setting and allow the machine to mix and knead the dough. I also let it do a first rise in the bread machine. Turn out the dough onto a floured work surface, knead lightly then divide into 24 pieces. Roll each piece into a ball and place onto a parchment-covered sheet pan. Dust lightly with flour and cover with plastic wrap. Refrigerate at least overnight, you can refrigerate for 24 hours if needed. The next day take the pan out of the refrigerator and let sit at room temperature for 15 minutes. This makes the dough easier to work with. While the dough is warming up, mix the tomato sauce, cheese and meatballs. Flatten each dough ball into a circle. Add a spoonful of the meatball mixture to the top of the dough and close the dough around the meatball mixture. Sprinkle a bit of Italian seasoning on each bun. Place back on the sheet pan. When all of the buns are finished, let rest for 10 minutes. Bake at 350°F for about 25 minutes, until the buns are golden brown. Serve with additional tomato sauce, if desired. Enjoy! I am a BREAD lover!! A year ago, I stopped eating bread altogether because of the gluten and sugar. So when I chose this recipe, I KNEW I was going to be in trouble, because I’d want to eat it instead of giving it away as a gift. Well, that’s exactly what happened. I absolutely love these little delicacies and you can add just about anything in the filling, or just leave them plain and serve with jam. Combine all of the ingredients (except the chocolate chips, vegetable oil and powdered sugar) in a medium bowl and mix well, making sure everything is evenly mixed and there are no dry bits. Cover the bowl with plastic wrap and refrigerate overnight. Remove the bowl from the refrigerator. 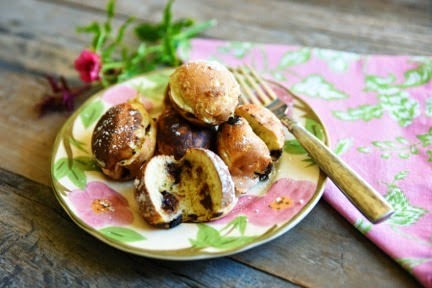 Heat your aebleskiver pan on medium heat until a drop of water sizzles when it hits the pan. Pour a small amount of vegetable oil in a small bowl and use a silicone brush to very lightly oil each well of the pan. Use a small spoon to fill each well of the aebleskiver pan with batter to about 1/3 full; the buns will rise as they cook. Sprinkle each well with a Tablespoon of chocolate chips and top with a teaspoon more of the batter. Let them cook for approximately 2-3 minutes before turning. You should see bubbles rising to the top as you would with pancakes. Test one aebleskiver to see if it is ready to turn. Insert a skewer into an aebleskiver and try to spin it in the well. If it doesn't release easily, continue cooking until it does (test again after another minute.) Once the aebleskivers are willing to release from the wells, use the skewer to turn them over in the pan. Some of the batter might “spill” into the pan -that’s fine. Continue cooking the aebleskivers, turning them as needed, until they are evenly browned on the outside and cooked through on the inside. You’ll have to break one open to check. You might need to lower the heat if the aebleskivers brown too quickly on the outside before they are thoroughly cooked inside. When the first panful is cooked, remove the aebleskivers and let cool on a wire rack, brush the wells with oil as before and continue cooking in batches until all the batter is used. We had a great surprise here at 37 Cooks! One of our own, Donna Currie, has a great new cookbook coming out soon, Make Ahead Bread: 100 Recipes for Melt-Your-Mouth Fresh Bread Every Day, and her publisher generously allowed us a sneak peak at ten of her wonderful bread recipes! She has an awesome, easy method for making bread...make up the dough one day and bake the next. I loved this! Our challenge was to put our own spin on these recipes. I chose Donna’s Mini Sunflower Seed Loaves. Right away pistachios popped into my head, so here is my twist…Lemon Glazed Mini Pistachio Loaves. Enjoy! Preheat the oven to 350°F. Make the egg wash by whisking the egg with 1 Tablespoon of water. Take each mini loaf pan out of the refrigerator and remove the plastic. Brush the tops with your egg wash and sprinkle the tops with the reserved 1⁄4 cup of chopped pistachios. Bake the mini loaves approximately 25 minutes, until they are golden (if you wish, you can also check the internal temperature, which is a cool new trick I learned from Donna’s book…it should reach 195°F.) Remove from oven and let loaves sit for about 5 minutes and then remove the loaves from the pans and cool completely on a cooling rack. Once cooled, make your lemon glaze and drizzle over the tops. They are also delicious without the glaze! Whisk ingredients together in a small bowl, making sure to whisk out any lumps. 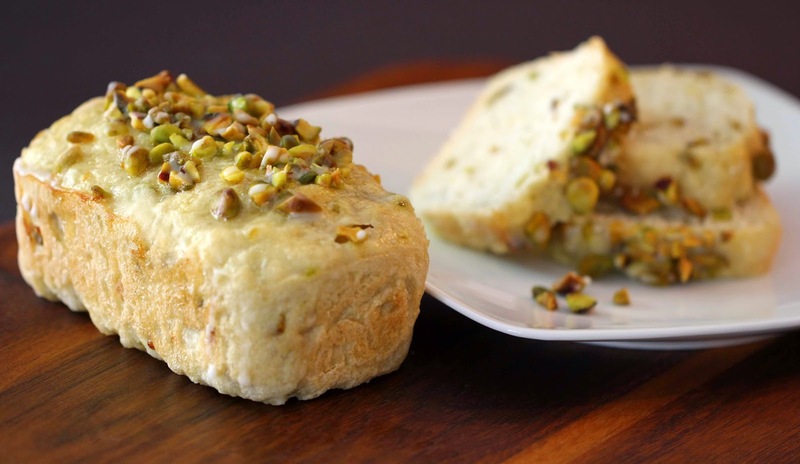 Drizzle over pistachio loaves.